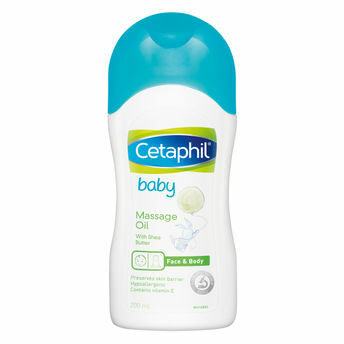 Cetaphil Baby Massage Oil contains Sunflower oil, Soybean oil, Shea Butter that gently moisturise and protect your baby's delicate skin. This mineral oil free and hypoallergenic oil is formulated to be gentle enough for newborn's and baby's skin. Cetaphil Baby is dedicated to expert care for your baby's delicate skin. Cetaphil Baby is Trusted by Doctors & Mothers globally. Additional Information: Complete your healthy skin routine with Cetaphil Products! Created by a pharmacist in 1947, the Cetaphil brand has been committed to its dermatology heritage for more than 60 years, delivering gentle, effective skin care. The brand has you covered no matter what phase you're facing with optimum skin care products to support the journey to help cleanse your skin without irritation, hydrate to restore skin's moisture, and help protect your skin against environmental elements. Explore the entire range of Massage Oils available on Nykaa. Shop more Cetaphil products here.You can browse through the complete world of Cetaphil Massage Oils .